For some reason when I get sick, I yearn for simpler times. Often there are only two things that can heal me: classic movies and keepsakes. Audrey Hepburn reminds me there is still grace and beauty beyond my tangled hair, raw nose, and the pile of snot rags which strangely joined forces to become a second blankie. Photos and old letters soothe me with their portrayals of youth and memories, so I can forget my phlegm-filled sorrows. Last week while I was playing Britt Sniffles, I plunged into the bottom of my messiest closet and busted out my dusty box of journals. OK, fine. They were diaries, alright? 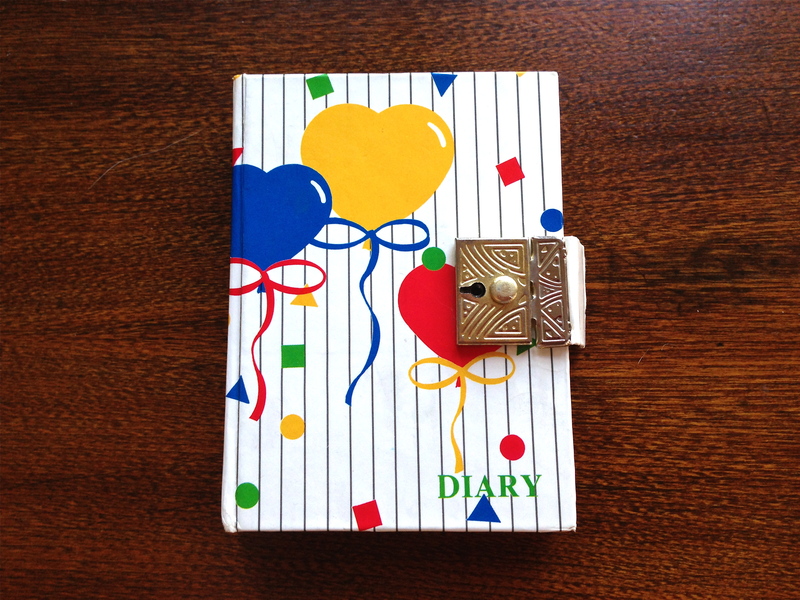 As entertaining as my angsty, whiny, and heart-broken stack from my late teens/early twenties is, I’ve decided to share tidbits from my very first diary. I’m a little unsure of the year, possibly 1990-1991. 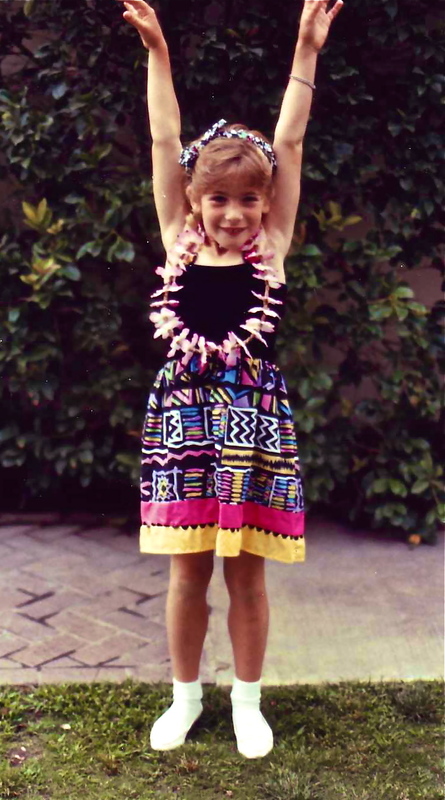 The Hula girl pic below is from the Britt era in question. For the sake of easier reading I fixed up some of the spelling errors, but I left the emotional quality intact. Today I got my first spiral perm. The perm took three hours. It was worse than I thought it would be. Today I did a Hawaiian dance. Before I danced, I ate. Then I danced, but I kind of messed up. I was lucky I was at the end of the line. Today I saw Indiana Jones and the Last Crusade. It was a funny movie. It was also exciting. Today was kind of an exciting day because I turned in my soda cans. I got fifty-three cents. So now I have forty-two dollars and fifty-eight cents. Today I learned how to do headstands and cartwheels and I was outside a long time with my friend. It was fun. Today I asked my dad to give me some words to look up. He gave me nine words and I looked up the nine words. Today we had burritos, salad, and milk. My lunch was good. Today at my reading class we had a test. I really don’t know if I got all of them right. I hope I did. Oh, Miss Gail! You know I tell you loves everything. You’re good peeps. LOVE this! It’s amazing to go back and remember how we thought as children, and the small firsts that were so exciting. Thanks for opening up your diary to us. Oh my god. I love this! Your diary is so much more interesting than mine. Many of mine declare a new love every other day. Boy, was I fickle. The others go on and on about things I vowed never to do to my kids when I grew up. My wise, 5th-grade self promised to never make my children eat Brusselsprouts. Oops! Broke that promise a few times. LOL! I guess I was more of the committed pup, with eyes for only one silly bad boy. Pretty sure he didn’t even like me. At least, he never let on that he did…that whole thing. Love your brussels sprouts vow! That’s so cute.